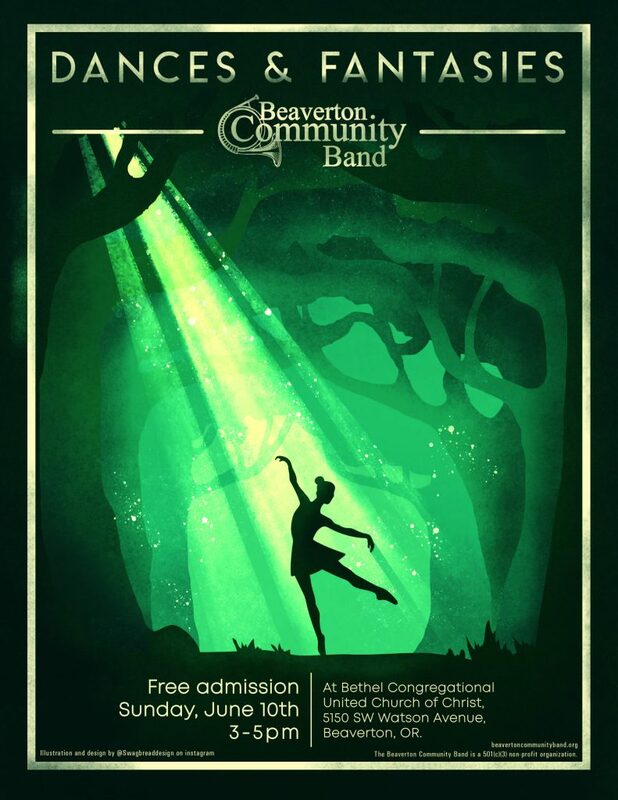 The Beaverton Community Band will present its Winter Concert, “Dances and Fantasies,” at 3:00 P.M. on Sunday, June 10 , 2018 at Bethel Congregational United Church of Christ, 5150 SW Watson Avenue, Beaverton, OR. This is a free concert. This concert’s theme is “Dances and Fantasies”, a salute to the great composers that influenced Academy Award winning movies, famous Broadway composers, musical journeys of the world of dance. This program has something for the young and the not so young. We will take the listener to the sands of Arabia in the 1920s, to the Bush Country of Australia, to the Grand 19th Century palaces of Italy, to the Lothlorien Forest of Middle Earth, and to the lower east-side of New York City in the 1920s — 1950s. We will, in addition, get your toes tapping and itching to dance with musical journeys to a Mexican Fiesta, to the choreography of Jerome Roberts in his premiere ballet Fancy Free accompanied by the music of Leonard Bernstein. We will tango and from Ecclesiastes III, A Time to Dance! This concert is free but we ask attendees to help donate to any of the many causes Bethel Congregational United Church supports. Please join us for this rousing concert.